League Cup final: Which factors will decide Chelsea v Spurs? Chelsea meet Tottenham in the Capital One Cup final on Sunday, with Jose Mourinho's Premier League leaders the favourites to lift the first domestic trophy of the season. The match represents a chance for the managers of both clubs - Chelsea's Mourinho and Tottenham's Mauricio Pochettino - to win a first piece of silverware since being appointed. Tottenham fans, look away now. The north London club's record against their Stamford Bridge opponents makes dismal reading. Spurs once endured a run of 26 games without beating Chelsea until they finally defeated the Blues 5-1 in a League Cup tie in 2002. The run of losses had stretched back 22 years. However, in recent years there has been a steady improvement - albeit slight - in Tottenham's fortunes against Chelsea, an upturn sparked by their League Cup final success in 2008, when Spurs beat the Blues 2-1. Since that game, Spurs' win percentage against Chelsea has doubled compared to their overall record against the Blues in the Premier League era. And who can forget the last time these sides met? Spurs produced one of the performances of the season to win 5-3 at White Hart Lane on New Year's Day. So how can Spurs upset the odds? A look at this season's statistics offers Spurs an insight into how best to beat Chelsea. The longer they are in contention, the greater their chance of victory. ...while Chelsea have been the league's most vulnerable side in the closing 10 minutes of matches. And if Tottenham are still in the game as the match nears the 90-minute mark, giving the ball to Harry Kane would not be a bad idea either. But what about the Chelsea threat? Tottenham may have the country's in-form goalscorer but when it comes to providing assists, Chelsea's Cesc Fabregas leads the way this season by a distance. The regularity with which he creates opportunities contrasts sharply with Spurs' leading supplier of goalscoring chances, Erik Lamela. Could the difference come from the dugout? When it comes to experience in winning trophies, there is no comparison between the two managers. 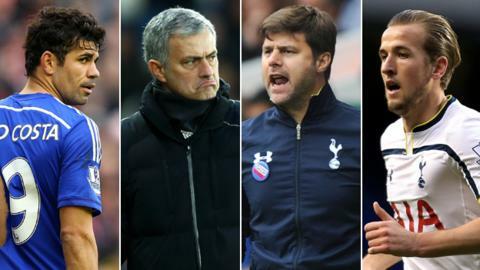 Pochettino, in his first season at Tottenham after spells with Southampton and Espanyol, has yet to claim a major honour, while Chelsea counterpart Mourinho is looking for a 21st piece of silverware. It is a trophy he has won twice before, including in 2005 when it marked the start of a successful run during his first spell at Stamford Bridge. The last time these sides met in a cup final - in this competition in 2008 - Spurs came out on top through Jonathan Woodgate's extra-time winner. Overall, the two clubs are tied on the same number of League Cup wins. But who will be celebrating on Sunday?